A fly landed in presumptive Republican nominee Donald Trump's hair while he held a rally at the Anaheim Convention Center in Anaheim on Wednesday, May 25, 2016. ANAHEIM, Calif. -- A fly appeared to have wanted to share the spotlight with Donald Trump during a rally in Anaheim on Wednesday. 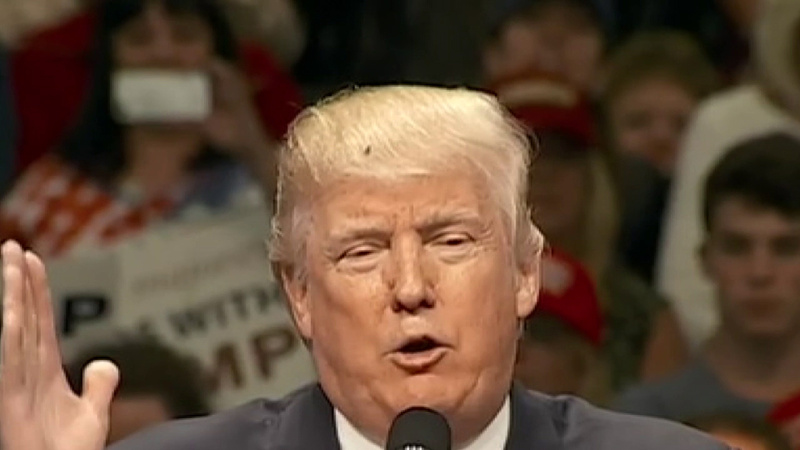 While speaking to the crowd at the Anaheim Convention Center, a fly landed in Trump's distinctive hair. Trump continued to speak, appearing to not notice the fly or simply choosing to ignore it. The insect seemed very comfortable, making no attempt to fly away in the midst of the high-powered campaign event. During a Bernie Sander's rally in Portland back in March, a little bird stole the show as it landed on the podium. The video of Sanders and the tiny bird went viral with the hashtag #BirdieSanders on social media. Trump, the presumptive Republican nominee, was in Southern California campaigning as California gears up for its June 7 primary.